With smaller more open landscapes in our work and home, it has become very difficult to find a quiet place to have a moment to yourself. Stille, which directly translates to 'quiet' is a chair that creates a private space within a busy home or office. It creates a room within your room, something that feels cozy and quiet without taking up too much space. 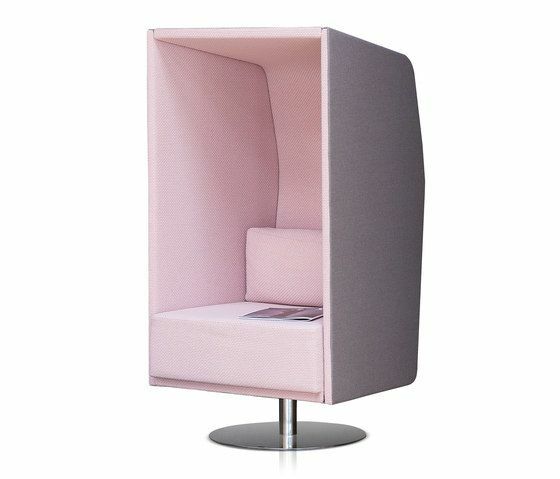 The chair sits upon a swivel base so that you can turn your back towards the crowd when you need privacy and then back towards the group when you want to chat. The walls and roof are filled with a special sound insulative foam, similar to the material used in sound studios, that keeps out the buzz of a busy office. The standard fabric is a wool blend from Gudbrandstalens, a Norwegian company. The Chair is designed and made in Norway.